Amazing map of Belarus just after the First Partition of the Polish-Lithuanian Commonwealth. Carte de la Lithuanie Russienne qui comprend les Palatinats de Livonie, de Witepsk, de Miscislaw, et une partie de ceux de Polock et de Minsk cédés par la Pologne à la Russie. 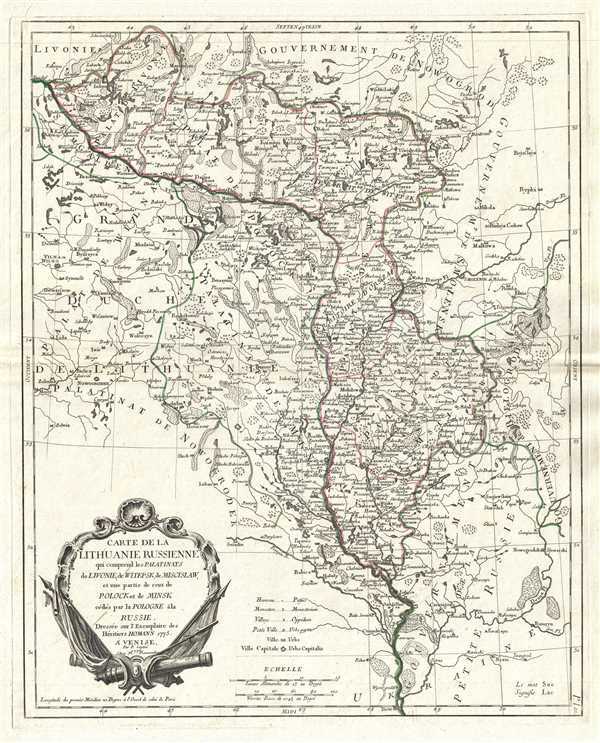 This is a 1776 Paolo Santini map of Lithuania and Belarus. The map depicts voivodeships (provinces) in the Polish-Lithuanian Commonwealth, which existed from 1569-1795. Stretching from the Grand Duchy of Lithuania (Grand Duché de Lithuanie) to the Government of Bielogrod (Gouvernement de Bielogrod) and from Livonia (Livonie) and the Government of Nowogrod to the Palatinate (Voidodeship) of Nowogrodek (Palatinat de Nowogrodek) and the Gouvernment of Little Russia (Gouvernment de la Petite Russie). Other labeled regions include the Territory of Witepsk (Vitebsk), the Polock Voivodship (Palat. de Polock), the Palatinate of Minsk (Palatinat de Minsk) and the Palatinate of Livonia (Palat. de Livonie). Numerous cities, towns, and villages are depicted as well as myriad lakes and rivers. This map was drawn by Santini from a map that was originally by the Homann Heirs a year earlier. Two years before, in 1773, the First Partition of the Polish-Lithuanian Commonwealth was completed. In 1772, Russian, Prussian, and Austrian troops simultaneously invaded the Commonwealth and occupied territory agreed upon among themselves six months prior to the invasion. The occupiers were delighted with their good fortune and expansion at the expense of the Commonwealth, and forced the ratification of the cession through the Polish parliament in September 1773. The Commonwealth lost approximately thirty percent of its territory, half its population, and eighty percent of its foreign trade production. In the following years, Poland was partitioned twice more, eventually leading to complete disappearance of an independent Polish state in 1795. An independent Poland would not reappear until after World War I. This map was drawn by Paolo Santini and published by Giuseppe Antonio Remondini in 1776. Francois [Francesco] Santini (fl. 1776 - 1784) was an Italian cartographer and map publisher based in Venice. Francois Santini is often confused with Paolo Santini, a Venetian engraver also known for religious prints and cartographic work. Scholarship is unclear whether these are related individuals, the same person, or completely unrelated. Both cartographers were active in roughly the same period and reissued maps of earlier French cartographers ranging from Vaugondy, to Jaillot, to De L'Isle, to D'Anville. Both cartographers also worked with the Venetian Remondini publishing house. Paolo was possibly an Abbot. Francois Santini seems to have worked extensively in Paris and is associated with several French cartographers of the late 18th century including Rigobert Bonne. His offices in Paris were located at Rue St. Justine pres de L'Eglise. In the 1780s Francois Santini published an atlas, the Remondini Atlas Universel, in conjunction with the Remondini family of Venice. The Library of Congress associates this work with Paolo Santini - leading to still more confusion. Very good. Original press mark visible. Blank on verso.